In the early 1920s Frank Lloyd Wright made his way westward to California, looking to explore new architectural ideas, building materials and forms. "Buildings, too, are children of earth and sun," said the architect, and where better to build them than the Golden State? Wright went on to design 26 buildings in California, but his greatest work may have been the Millard House—the home Wright lovingly referred to as "La Miniatura". 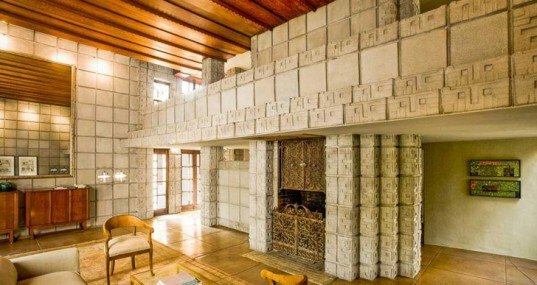 Built in 1923 for rare books dealers George and Alice Millard, the concrete textile-block house was the famed architect's first foray into modular building. If you've always wanted to own an iconic work of architecture, this beautiful, now-completely-restored home could be yours. WSJ Magazine tells us that La Miniatura has just been listed by Crosby Doe Associates for $4.5 million. Click ahead to learn more about the Millard House and to see more photos of this spectacular residence. The Millard house is one of five concrete block homes constructed by Wright in Southern California — others include the Hollyhock House, the Freeman House (under the care of USC), the John Storer House (owned by Hollywood big-wig Joel Silver), and the Ennis House (which you may recognize from Ridley Scott’s Blade Runner). The home represents Wright’s first foray into modular building, and his efforts to break away from the “prairie house” architectural style that had become synonymous with his name. He turned to concrete as his new building material in 1906 when Alice Millard commissioned him to construct her second home on a lush green site located in Pasadena. Wright challenged himself to only create something beautiful from what he called “the cheapest (and ugliest) thing in the building world”, and to develop a new low-cost flexible building system with the same material. Given the unique location and formation of the site, Wright wanted to design a structure that would meld with the land. The home clings to the lot’s steep ravine, nestled within a thicket of trees. To build the blocks, Wright took sand, gravel and minerals found on the property to create earth-toned concrete that would help the building blend with the natural landscape. Wright aligned both the method of building and the aesthetic of La Miniatura with his lifelong love of natural materials and his belief that buildings should belong to their surroundings. Unfortunately, fabricating the blocks was not as quick and easy as Wright had hoped. While the building system was flexible, it proved to be more expensive than planned, and the house was 70% over budget, totaling $17,000. Some accounts report that the builder walked off the job, leaving Wright to pay for the remaining costs out of his own pocket. Wright did however get the last laugh. To date, the Los Angeles Times has named the home one of Los Angeles’ 12 most significant landmarks, and in 1980, The New York Times ranked it among the few buildings in Los Angeles that “have become classic works of the 20th Century”. While beautiful, the blocks have proven to be far from sturdy and reliable over the years. All of Wright’s concrete homes have required some level of restoration. And even shortly after Alice Millard moved into the home, a storm flooded the lower floors and Millard wrote to Wright complaining about the inadequate storm drain that resulted in the basement filling entirely with muddy water and the water rising to six inches in the dining room. La Miniatura is three stories, measuring 2,400 square feet in total with nearly an acre of gardens. The first floor has the kitchen, dining room and maid’s room, and the dining room opens to a terrace with a reflecting pool that connects the house with the outdoors. The main entrance is located on the second floor along with a guest room and a large two-story living room with a beautiful concrete block fireplace. A balcony at the third story overlooks the living room below, and the third floor also hosts what was Millard’s bedroom and a beautiful outdoor terrace. While the load-bearing walls are constructed of concrete blocks, the interior walls consist of wooden studs and plaster. The floors are either concrete or wood, and the ceilings are plaster or exposed redwood. 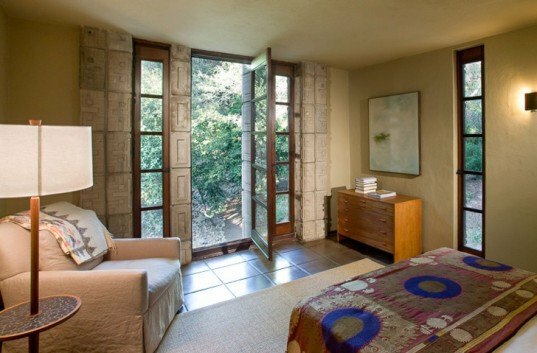 In 1926, Lloyd Wright, Wright’s son, designed a separate studio and guest house. Back in 2009, La Miniatura was placed on the market for $7.7 million but couldn’t find a buyer. This time around the home is selling for a mere $4.5 million dollars. The work that’s gone into the home has surely lent to the hefty price tag, and as they say “location, location, location” — La Miniatura is sited in the heart of Pasadena within a lush, green and quiet residential block overlooking the Arroyo Secco Park. The home is also in good architectural company, located just a few blocks from Greene and Greene’s famed Gamble House, as well as a few of the brothers’ other homes. If you’re in the market for some serious real estate, we think this is a good bet. There are far worse investment decisions you could be making. 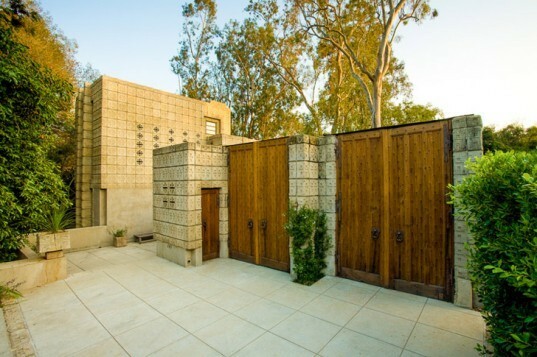 The Millard house is one of five concrete block homes constructed by Wright in Southern California — others include the Hollyhock House, the Freeman House (under the care of USC), the John Storer House (owned by Hollywood big-wig Joel Silver), and the Ennis House (which you may recognize from Ridley Scott's Blade Runner). The home represents Wright's first foray into modular building, and his efforts to break away from the "prairie house" architectural style that had become synonymous with his name. 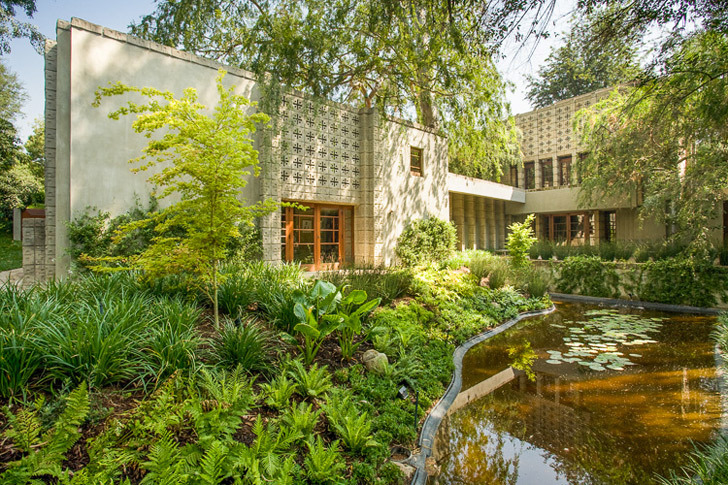 He turned to concrete as his new building material in 1906 when Alice Millard commissioned him to construct her second home on a lush green site located in Pasadena. Wright challenged himself to only create something beautiful from what he called "the cheapest and ugliest thing in the building world", and to develop a new low-cost flexible building system with the same material. Given the unique location and formation of the site, Wright wanted to design a structure that would meld with the land. The home clings to the lot's steep ravine, nestled within a thicket of trees. To build the blocks, Wright took sand, gravel and minerals found on the property to create earth-toned concrete that would help the building blend with the natural landscape. Wright aligned both the method of building and the aesthetic of La Miniatura with his lifelong love of natural materials and his belief that buildings should belong to their surroundings. When developing his concrete block technique, Wright used a standardized block as the basic design unit. The blocks were constructed using wooden molds and a tongue and groove system reinforced with conventional mortar. Each of Wright's concrete homes has its own unique block design, and the Millard House features a modernized pre-Columbian motif of a central cross and a square in each corner. Some of the blocks are solid while others are perforated to allow filtered light through the cross, breaking up the dullness and visual mass of the concrete. 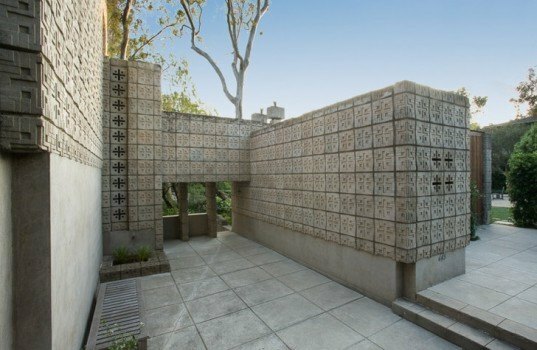 Moreover, by adding ornamental designs to mass-produced blocks, Wright hoped the blocks could become a "masonry fabric capable of great variety in architectural beauty." When the home was finally completed, critics were not kind to Wright, and the Millard house was met with laughter from Beaux Arts-trained architects who mocked Wright for using such a common building material with such expensive homes. Even The New York Times later ridiculed the architect for his concrete construction, writing: "It didn’t help that he was obsessed at the time with an untested and (supposedly) low-cost method of concrete-block construction. What kind of rich person, many wondered, would want to live in such a house? Aside from the free-spirited oil heiress Aline Barnsdall, with whom he fought constantly, his motley clients included a jewelry salesman, a rare-book dealing widow and a failed doctor." Wright did however get the last laugh. To date, the Los Angeles Times has named the home one of Los Angeles' 12 most significant landmarks, and in 1980, The New York Times ranked it among the few buildings in Los Angeles that "have become classic works of the 20th Century". While beautiful, the blocks have proven to be far from sturdy and reliable over the years. All of Wright's concrete homes have required some level of restoration. And even shortly after Alice Millard moved into the home, a storm flooded the lower floors and Millard wrote to Wright complaining about the inadequate storm drain that resulted in the basement filling entirely with muddy water and the water rising to six inches in the dining room. Despite these drawbacks, the home has endured and La Miniatura was purchased by David Zander, an architecture enthusiast and president of commercial/music video production company MJZ, back in the late 90s. Zander took to restoring the property with the help of architects Marmol Radziner. 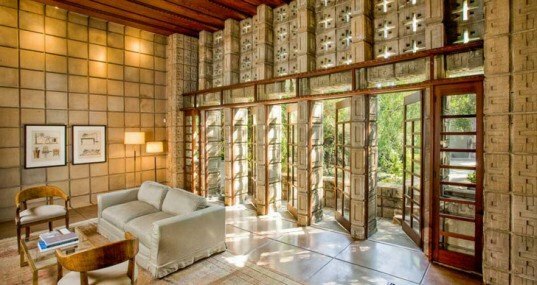 The home is in fact part of his "collection" of architectural masterpieces, which includes the Schaffer Residence designed by Frank Lloyd Wright protege John Lautner, and the 1906 Arts & Crafts-style Duncan-Irwin House designed by Greene & Greene. Unsurprisingly, Zander was struck by Wright's beautiful design and knew that he had to own it, even with the costs that would come with restoring the home to its ideal state. "These places demand respect," Zander told Departures in 2005. "They just ruin you for anything else. Once you experience how intelligently designed they are, how much integrity they have, you can't live any other way." Back in 2009, La Miniatura was placed on the market for $7.7 million but couldn't find a buyer. This time around the home is selling for a mere $4.5 million dollars. The work that's gone into the home has surely lent to the hefty price tag, and as they say "location, location, location" — La Miniatura is sited in the heart of Pasadena within a lush, green and quiet residential block overlooking the Arroyo Secco Park. The home is also in good architectural company, located just a few blocks from Greene and Greene's famed Gamble House, as well as a few of the brothers' other homes. If you're in the market for some serious real estate, we think this is a good bet. There are far worse investment decisions you could be making.